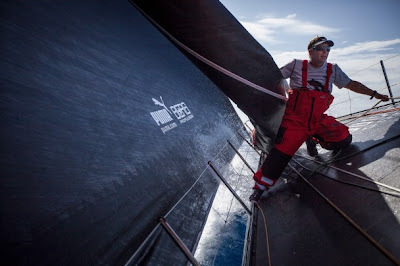 The crew of PUMA Ocean Racing were breathing a sigh of relief early on Thursday morning after not only punching through the cold front blocking their path to the trade winds but also regaining control of the fleet. Early celebrations on Ken Read’s boat came to an abrupt halt when, immediately after breaking through the frontal line, they were becalmed and could only watch as their rivals approached from behind over several nail-biting position reports. But, with total faith in their navigator Tom Addis, the PUMA Ocean Racing powered by BERG crew were finally rewarded for their efforts as they watched the rest of the fleet grind to a halt as they suffered the same fate. At 0400 UTC PUMA held a 17-mile lead over CAMPER with Emirates Team New Zealand, Abu Dhabi Ocean Racing, Team Telefónica and Groupama sailing team. “It seems we are through both front and ridge and finally free to point north, but it was not without its troubles. “We first pushed through the frontal barrier with little resistance and it was a few hours more before we approached the east-to-west line of windless convergence extending three quarters of the way across the Atlantic. “Getting anywhere first during a race always brings moments of excitement and anticipation, but in this case life quickly turned tense as forward progress came to an abrupt stop. “We found ourselves without wind, aimlessly drifting while trying to keep the rig from punching through our lifeless and hanging sails. “It’s one thing to simply sit there, but to spend all of your idle time wondering if it’s a condition the other boats are dealing with too is unpleasant and stressful. “So many times this race we’ve found ourselves in that situation: becalmed and vulnerable, forced to watch while the others just sail around the outside. “That feeling of total helplessness is one nobody wishes to relive, and as we sat there today, even moving backwards at one stage, all we could think about was the next sched. “Would our lead evaporate in three hours time? Would we be stuck here, isolated and slow, having shown the fleet where not to go? Or are we okay…are the others drifting too? “It’s an unbearably difficult range of emotion, having worked so hard to get where we are, and to possibly see it vanish in just a few watches time. “Man. Another three hours of waiting, wondering, doubting, and fearing—preparing again for the worse. Everyone’s just trying to make the boat go forward, any way possible. Eyes peeled on the horizon for positive signs of any kind. “Finally, a hint of wind. Two sail changes later and we’re slowly on our way again. Another hour goes by that seems like an eternity and we’re actually going well again. But is it too late?? Sched time…everyone’s anxious. The intercom flicks on. ““Puma…did 10 knots…040.” Moment of truth. “Telefonica…2.3. Camper, 2 knots. Abu Dhabi, 3.1. Groupama, 2.6”.